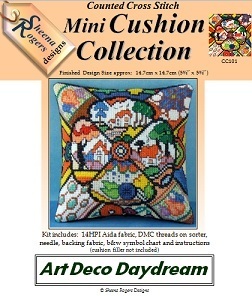 This Art Deco themed mini cushion design was inspired by the vibrant patterns created by the most prolific and important English Art Deco ceramic artist of the Twentieth Century - Clarice Cliff. Let your daydreams take you through these bright country scenes, passing by the white cottages, stopping to admire the crocuses, while being surrounded with vibrant shapes and patterns. Only whole cross stitch is required to stitch this design (so no fractionals), with some backstitching needed to define the cottages and trees.